Sometimes that craving for something salty and crunchy hits and when you have diabetes you can’t really just turn to a big bag of potato chips. They’re full of carbs and fat plus it’s really hard to portion yourself. Want a healthier option that’s still delicious without all of the carbs? 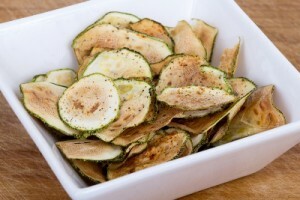 Give zucchini chips a try! You can season them however you want so you don’t need to worry about getting bored of the same flavor over and over again. Personally I think some Cajun spices really make these chips something special! Preheat the oven to 225 degrees F. Prepare your cookie sheet. You can either just spray it with the cooking spray or lay down parchment paper and then spray that. Put your zucchini slices on the sheet in one even layer. Spray the tops very lightly with cooking spray. In a bowl, mix all of the seasonings. You can make a bigger batch and put it in a shaker if you want to have more for later. Sprinkle over the zucchini. You may or may not need all of the seasoning, just season to taste. Remember these will shrink to nearly half their current size so don’t over season. Bake for 40-50 minutes or until crisp and brown.